Pours a deep, winelike ruby with a nose of roasted malt, dark fruits, vanilla, sweet and sour cherries, coffee, currants, brandied raisins, and chocolate. Exceedingly smooth on the palate, never cloying. Finishes warm with an assertive but comfortable alcohol blast. I feel like I have had this beer before. Maybe not. I have seen it before, I can tell you that. 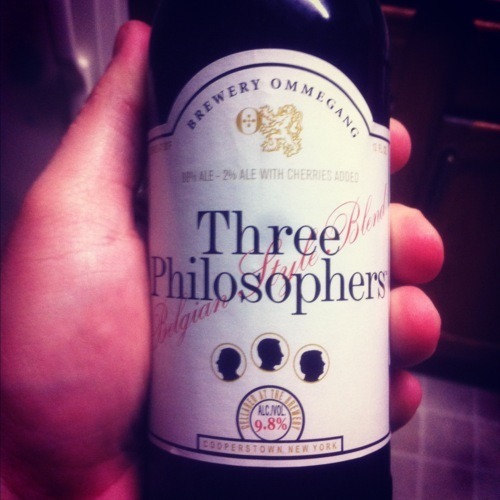 I love the label, and until I sat down to research this beer had no idea there were actually three philosophers. I like the fact they would sit around and “think about nothing”. I do that. The next time I look like I am starring off into space, just know that I am sitting there thinking about nothing! Let’s see what this big beer has in store for us. It’s just shy of 10% ABV… bottoms up! In the Glass: It looks like a barleywine in the glass, and there are tons of bubbles racing to the top. It has a very thick, creamy head that produces a solid lace. The beer doesn’t appear to be thick, but with an ABV that big I am sure it has something in there for the liking. Flavor: Whoa. There are like ten things going on there. There is barely any carbonation. Those bubbles are deceiving. You get the simple sweetness on the front half of the palate before the smooth and warm alcohol induced finish takes hold. That heat sticks around too, and gives you a longing for another sip. Be careful though, because a beer like this can and will sneak up on you. Mouthfeel: It feels good. It’s smooth, and doesn’t have the boozy flavors until the aftertaste. But even then, you are hit with the dark caramel and chocolate notes that make it easy to drink. I have been sipping on a Bell’s old style this week, so I am trying my best to not compare… but it’s close to that. Aftertaste: The aftertaste is good. It changes as time goes by, too. At first the aftertaste is warm, and covered with alcohol. Then it settles down and you get those dark fruits and that chocolate they talked about in the tasting notes. This beer is a quad, and whatever that means… it’s good. I would totally order this bad boy again. Bottoms up people! I picked out tonight’s beer. I recognized the label because I’ve seen it before, but I can’t remember if I’ve ever had it or not. It’s a pretty classy looking label, for a beer called Three Philosophers. It’s in a pretty small bottle, but that’s ok. I don’t need the calories anyway. The beer actually has quite a bit of head on it. Ricky’s had a lot of head. And even mine, which has been poured into the glass now for a few minutes, still has a pretty even bit of foam hanging around at the top of it. The beer itself looks quite thick. It’s a reddish-brown color, and I held it up to the light and couldn’t see through it. Well, ok – I could see through it just enough to see the little floaties in it. There’s a lot in this beer. I can’t quite much from the smell, though. It mostly just smells wet, with maybe a little bit of fruit to it. Yep… second smell. Just not much there. I’m guessing this beer has way more taste than smell. Let’s find out. Whoa. I was definitely right. First sip packs a punch. First of all, this beer is very fruity, with some sour taste in there as well. It’s also got a hint of carbonation. But it has a lot of flavor in there. I love it. Ok, I’ll just say it – this beer is yummy. It’s rare you find a beer with such an explosion of flavor. This is definitely a beer to savor, not gulp down. It’s a sipping beer, one you could taste all night. It’s like you take one drink and have to sit there and let it sink in for a while before deciding that it was so good that you need more. Great taste. Definitely one I’d buy again. And again.